INDUSTRY.co.id - Banjarmasin - President Joko Widodo promised to help to complete the construction of two dormitory buildings of Muhammadiyah University of Banjarmasin, South Kalimantan Province, which was only two years old. Currently UM Banjarmasin is building an 11.4 hectare campus in Barito Kuala District to accommodate 2,900 students. "So my part at the beginning of next year Insya Allah if the land is ripe, I start two dorms first, the two dorms are many because of three floors One dormitory worth approximately Rp12-14 billion so if two dorms multiplied by two," said the President. Even the President also promised to re-add aid if needed. 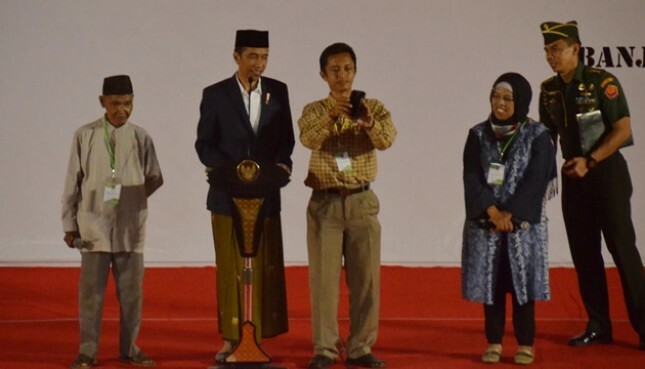 "Inshallah, we will start next year, if urgent is not anything more, this month I send the team to see the field, Insha Allah will be prepared soon, and then convey to the Minister of Education and Culture let me to my hands directly," said President Jokowi. UM Banjarmasin Rector Prof Chaerudin said that until now the campus is still doing some efficiency to reduce the budget. "The building in the back will be built 11 thousand square meters with a budget of Rp60 billion, but God willing with the efficiency to Rp10 billion and in December will be inaugurated," Chaerudin said as quoted by Antara. The next location to be inaugurated is an auditorium containing 2,400 people plus mosques and other facilities. With the struggle and togetherness of the lecturers, education personnel, the buildings as educational facilities that can be built and manifested and its contents, AC, his laboratory, God willing on September 23 will start some faculty; added Chaerudin while the dormitory will stand on a land area of ​​five hectares.